According to a recent survey by the Bank of Nova Scotia, most Canadians have yet to create a proper estate plan and Powers of Attorney. Results indicate that 50% of a Canadians have a Will and only 30% have a Power of Attorney for Property. Only half of those with a Will have talked with their family about it's contents. This report discusses the importance of having these documents in place and making your family aware of your wishes. 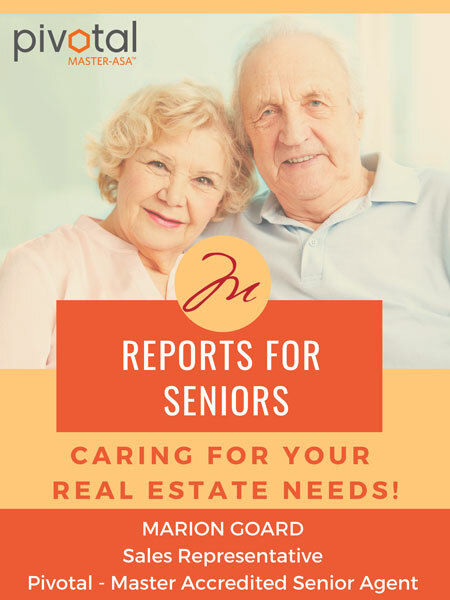 Many seniors haven't bought or sold real estate in many years. It should come as no surprise that there have been some major changes in real estate practices over the past several years, let alone in the past 30 years! This report highlights most important aspects of the changes to be aware of. Dying without a Will can leave an unwanted legacy – one of anger and chaos for those who matter most to you. Learn the top 10 reasons people give for not having a Will – and avoid doing the same. What Do I Do With All My 'Stuff'? It's one of the most common concerns among seniors. A lifetime of 'stuff' and no idea of what to do with it all. Here are a few ideas of what to do with your 'stuff'. Will Your Next Move Be By Choice Or Will Circumstances Rule? As we age there will likely come a point where we can no longer easily take care of our home. A move then should be full of joy and anticipation of the next phase of our life. Having a plan in place for when the time comes will help avoid emotional turmoil, depression or even anger and will help you feel like you're in control as opposed to feeling forced into something you're not prepared for. There are some important questions that can slip through our radar. This report presents questions for you to think about in advance of when you really need the answers. To be in a position to help seniors most effectively, there are some things that are essential that we talk about. Here are a few questions to consider as a starting point. As real estate transactions involve what is likely your largest investment , it's important to sort out how the REALTOR® you choose to work with relates to you and meets your needs. Here are some things to consider to determine who would be the person the right person for you. It's time to move on to the next phase of your life. To guide you through the process it's important to make sure you hire the best agent for your needs. Use these questions; they'll help you make the right choice. Senior Move Management. What Is It? Do I Need It? Are you conflicted about whether to share the contents of your Will or larger estate plan with your beneficiaries who would generally be your children? In many cases, both the parent and child can benefit from engagement in a discussion about how, when and why wealth is going to be transferred. Read this report to help determine the right approach for you. While it's important to have a Will it's also important to ensure it's up to day. Learn which events may invalidate specific gifts or even the entire Will – and some remedies to help ensure it doesn't happen to you. 2 Complete this form, and we'll email them to you!